It took more than two thousand years of mankind’s ingenuous devices to search for each other to finally develop the Spy Tec STI GPS tracking system Spy-Tec-STI_GL300-Portable-Tracker . The system is small enough to be perfectly discreet, no larger than a simple matchbox that can easily slip into a pocket, handbag or backpack, or it can be magnetically attached to vehicles and other objects that you want to keep track of. Whether you’re trying to follow the movements of a major shipment of merchandise or keep tabs on your young ones, the Spy Tec STI GPS Tracker by our standards delivers the best value for your investment. When measured against the competition, the Spy Tec offers more features and more accessibility and has received more positive reviews than any other GPS Tracking device we’ve examined. The small battery operated device will lock on to your subject and keep you apprised of its location and every movement it makes no matter where it goes. The Spy Tec STI_GL300 Mini Portable Real Time GPS Tracker is top of the line. Its newest technology allows you to get a tight fix on your target’s location and is accurate to within a single meter. It can be followed on any portable electronic device from computers and tablets to smart phones with pinpoint accuracy. Our step-up pick, the MasTrack OBD Real Time GPS Vehicle Tracker was specifically designed to keep track of any passenger vehicles or lightweight trucks manufactured with an OBD port. Most often used by businesses with the need to keep track of their vehicles and personnel. Parents can keep close watch on the activities of their teen drivers or any loved ones while they are out of their watch. Comes complete with a full year of Basic Service so you can keep track of their minute-by-minute activity in real time. It has everything you need to start tracking your vehicle. The price includes a full year of Live Basic GPS Tracking along with a Theft Recovery feature in case your vehicle is stolen. It is simply installed by plugging the tracker into your vehicle’s OBD-II port, found on vehicles manufactured after 1996 and easy to use as it can be tracked with any Internet enabled device. The tracker can be used on any passenger vehicles or lightweight trucks and comes with everything needed to start LIVE GPS tracking right away. This is a very popular choice for meeting all sorts of tracking needs. Our Budget Pick, the Trackmate GPS Tracker gives you a real time hard wired GPS system with four separate options for plans. Depending on the plan you choose you can get a full update every three seconds in real time. An affordable option for fleet operators, it comes with geo-fencing alerts, live fuel monitoring, and alerts sent to your email, cellphone or other portable electronic devices. We’ve come a long way from the days when the Chinese discovered that the metal loadstone was a natural magnet that always pointed to the south. The discovery was the first in man’s history of devices to help them find their way. It wasn’t long after that the compass was born (around 200 BC). This invention opened the way to all sorts of location finding devices throughout our history. Today’s devices now do much more than point directions; they can help us find our way, track down missing persons, and even give us directions when we get lost. GPS Systems provide satellite signals that are processed by devices that can receive, track, and compute the data to pinpoint the location of an object of interest. In simple terms, GPS Trackers are basically technological devices used to locate people and things by means of the Global Positioning System, a manmade constellation of 24 satellites positioned in Earth’s orbit. As long as there is a ground receiver in close proximity they can pinpoint with amazing accuracy the longitude, latitude, and the speed of movement of any person or object it has its lock on. Today, GPS devices are used in a wide variety of areas. It is an invaluable tool for public services like the police, firefighters, and military personnel. Shipping companies use them to keep track of the fleets and delivery services can now make their deliveries in record time because they no longer have to resort to mapping out routes to get to their destinations. There are even GPS receivers in our smart phones, laptops, and tablets so we always have a means of locating the things we rely on. Choosing the best GPS Tracker for our readers comes down to more than just what features are offered. Once you start searching, you’ll find a wide range of trackers that offer a vast number of features but you’ll quickly realize they don’t all suit your purposes. People use GPS Trackers for many reasons so we had to refine our search to find those trackers that offered the widest range of possibilities. 1) One of the first things considered was the versatility of each device listed. We selected only those trackers that could be used in a variety of situations and was not limited to one single function. 2) We also looked at the track record and dependability of the manufacturer. Those who had a reputation for producing high quality devices made it to the top of our list. 3) Portability was another factor that required careful consideration. Devices that were small and compact enough to be carried discreetly were given a higher ranking than those devices that required permanent attachment to an object. Also (in the case of tracking children or pets) being able to attach the device so that it won’t get lost or damaged was also important. 4) The length of the battery life was also a major criterion in determining which trackers made it to the top of our list. We found that some batteries we checked only lasted for a few hours or a single day before recharging. These, while they may have been very effective in tracking did not rank as high as those whose batteries could last for several days before they needed a charge. 5) Finally, we looked at the different plan options and their relative cost. Those that had plans that allowed easier interactions between the tracker and the app used ranked higher than those who had strict, inflexible plans that were more costly. The Spy Tec STI_GL300 Mini Portable Real Time GPS Tracker offers superb accuracy with the latest in GPS satellite technology. The device offers 3-axis accelerometer so you can get a precise location even when the object or person you’re tracking is in motion. It has the latest in technology so you can quickly monitor your vehicles or other objects with ease. It’s small, compact size, only slightly larger than a matchbox can be discreetly hidden from sight or can be magnetically attached to your object with their small waterproof casing (optional). Your tracker can then be connected to your portable electronic devices so you can check the location at any time. The tracker will monitor the movements throughout the day or evening giving you back real time reports on time, speed of movement, and its precise location within just a matter of a few meters. You have the capability of setting it to receive alerts for certain conditions. For example, you can be alerted if your vehicle moves beyond a certain speed or if it moves beyond a specified area that you set up for yourself. It has a long lasting battery that unlike other trackers can last for up to two weeks of continuous monitoring before recharging. This way you can monitor your valuables at any time and in any place. To keep up to date with whatever you’re tracking, you will be required to maintain a monitoring plan. While this is considerably more costly than other tracking devices, it is well worth the investment if you need to receive a continuous feed of recorded information that can be tailored to your specific needs. This data is stored for up to a year so that you collect a history of locations frequented and activity in specific areas. Their online portal is well thought out and easy to understand and can be accessed from any modern browser. So, even if this is your first time using a GPS tracker you should be able to operate and monitor it with relative ease. One of the biggest drawbacks to the SpyTec GPS Tracker is its monthly payment plan. Like any other tracking device there is a monthly charge but the SpyTec plan utilizes a rather expensive fee structure. Depending on the plan you choose, some could allow you to keep track of your things minute by minute or as frequently as every 5 seconds. This is more expensive than other plans but will offer you a more accurate accounting in real time. The SpyTec has a lot more great features that can only be accessed if you’ve chosen the more expensive plans so you’ll have to purchase an upgrade from the Basic if you want to unlock all of its potential. Another disadvantage that SpyTec owners have is while battery life can be as long as two weeks recharging can be inconvenient if you’re traveling. There is no plug that will allow you to recharge the battery through your car’s power plug so you’ll have to recharge through a standard indoor power source to keep it running. MasTrack OBD Real Time GPS Vehicle Tracker comes with a full one year Theft Recovery feature that includes everything you could possibly need to start tracking and monitoring activity for up to one year. When tracking vehicles, simply plug the tracker into your OBD-II port and use any mobile device with Internet access to monitor. Through your plan you’ll receive live map updates with no limit to the number of reports you can receive. It is the only tracker to date that operates on the two top wireless networks, giving you more coverage than any other tracker. It’s easy to install and use; powered by your own vehicle, you won’t need to worry about constant recharging issues. Every time you start your car, you’re recharging the MasTrack battery. Regular alerts are issued for anything related to safety, security, or even vehicle efficiency. It allows for geo-fencing so you can personalize the areas the vehicle is allowed in and be notified if it goes beyond your preset boundaries. You can also receive alerts if the vehicle is speeding, being tampered with, idling for too long, or even when the ignition is turned on. Options to be fed a steady stream of data, as it happens or to receive information on demand when you ask for it. 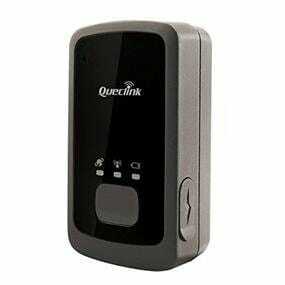 An extremely sophisticated device that can be used in a variety of settings including tracking a fleet of vehicles or just monitoring your own personal property. Just like other trackers, the Trackmate offers a history of movements to refer back to when needed. It can also maintain vehicle maintenance records that include scheduling and routing; an option that is great for fleet operators. It issues user-friendly reports that can be printed, emailed, or downloaded, geo-fencing alerts, and regular reporting when the vehicle or object being tracked is not in motion. Like our Step-up pick, the Trackmate must be hard wired to the vehicle you’re tracking. This takes away the ability to move it from one object to another if need to. So you will have to purchase one tracker for each vehicle you plan to track. However, its monthly plans are much more affordable. You’ll get real time tracking along with live, up to the minute traffic conditions whenever needed. The Trackimo was a pretty strong contender when it came to comparisons with the other GPS Trackers on the market today. The only reason it didn’t make the top of the pack was because of a limited number of customer reviews. It is clear that the Trackimo is making its way up the ranks. This device works in North and South America, UK and Europe so you can find your valued possessions no matter where you are. It is adaptable to track cars, children, dogs, cats, luggage, and just about anything else you need to monitor. It also comes with a free year of monitoring and mobile data included in the purchase price. You only begin to pay monthly service on the first day of the second year. It gives real time tracking for no additional charge, an SOS Button, GEO-Fencing, and Smart Alerts that can include reports on changes in the speed of movement if you like. Its silicon cover is water resistant so you it can be used in a wide range of weather conditions and it comes with a replaceable magnetic back cover so it can be discreetly attached to a wide variety of places. The long battery life can last up to 144 hours (approximately 6 days) in standby mode and can be charged through a regular USB portal. If you’re thinking of monitoring several items (a fleet of cars for example) you can manage them all through one account. A little on the pricier side, the DeLorme AG-00971-201 inReach SE offers the ability to send and receive 160-character text messages regardless to where you are in the world. The messages can give you the exact GPS coordinates to cell phone numbers as well as email addresses so you can locate your target no matter where it is. It also sends confirmations whenever your messages have been received. Only the DeLorme has the capability to be paired with your iOS or Android mobile devices so your communication abilities can become completely portable. Holders of the device can trigger an emergency SOS at will and enable two-way text communication around the clock allowing them to communicate directly with rescue and monitoring centers. The GEO centers work with the local authorities to coordinate rescue efforts and keep you apprised of the present situations, informing you of approximate ETAs giving you positive reassurance in the face of a crisis situation. Its batteries are powered by Iridium, which works under the world’s farthest reaching satellite constellation making it the only GPS system that can give you global coverage no matter where you are in the world. The SPOT Gen3 is another highly efficient tracking device allowing you the capabilities of sending messages in areas that are normally blocked and well out of the reach of cell towers. The Gen3 can communicate with your family and friends notifying them of an emergency situation within seconds, giving them your exact coordinates at the single push of a button. The pocket sized device can be attached to your essential gear and allow you to stay connected regardless to where you may roam. The device is motion-activated where a vibration sensor reports movement updates at intervals that you select. It also comes with a powerful battery saving feature so you can get twice the battery life of its predecessor the SPOT Satellite GPS Messenger. You can operate the device with 4 AAA Energizer Ultimate Lithium Batteries, 4 AAA Energizer NiMH reusable batteries, or with Line power with a 5v USB connection. Along with the ability to send an emergency SOS at the push of a button, you can also check-in with people periodically to let them know you’re okay, request help in non life-threatening situations, or send a custom message notifying someone of your exact GPS location. Others can also keep track of your movements and activities in real time when you go off the grid for any reason. The SPOT Gen3 comes with a carrying strap, USB Cable, a Quick Reference Guide, Carabiner, and the batteries needed to get you started. If you’re looking for something that can work anywhere and is adaptable to both the GSM Network and Bluetooth, you’ll find the Yepzon One Personal GPS Locator is the ideal tracker. It’s ability to follow a constantly moving target allows you to track the object of your attention and provide feedback at least once every 10 seconds. It has a very simple to use App that is capable of working with any mobile device and without the use of passwords or complicated registration procedures. Because it will go to “sleep” when not in use, you can expect the battery to last for weeks and sometimes even months. The device is versatile enough to locate people, pets, and/or valuables in a safe and secure way. The GPS locater can be easily attached anywhere so you don’t have to worry about being out of range. It comes with a full six months of free usage so you don’t have to worry about paying for a monitoring plan until much later. Its waterproof casing allows you to monitor your most valuable possessions or most cherished people in any climate or in all sorts of conditions. The MOTOsafety Tracker is the perfect solution for those who may have other people using their vehicles. Whether it is a teen driver or a family member using your car, you can know with 100% accuracy what’s happening with your vehicle at all times. Its real time technology can give you regular updates on its location, direction of travel, speed, traffic conditions and more. You can review driving routes, set up your own geo-fences, and know when the vehicle is in use at all times. The device comes with nationwide tracking coverage and a free 30 days of service. No long term contracts to sign or any cancellation fees. You can track from anywhere in the country on your mobile device with their free mobile apps and get real-time message alerts by text or email whenever you need them. The LandAirSea Tracking System is popular among parents who wish to monitor their teen’s driving habits. Employers responsible for managing employees who are out on the road can also make good use of its many features. Its small pocket-sized GPS receives signals from a constellation of 24 different satellites in orbit around the earth. It can accurately determine the location of an object within 2.5 Meters and can record every second of monitoring time. It can be discreetly hidden underneath or inside the vehicle so your monitoring can go completely undetected and can function on land, in the air, or on the sea giving you the greatest coverage possible. The Whistle GPS is our best recommendation if you’re looking to keep track of a wandering pet. The system will notify you if they ever leave the customizable safe area that you set up and allows you to monitor and track their movements directly from your smartphone or tablet. The device comes with nationwide coverage so no matter where he goes you will be able to track him. You get on demand alerts providing you with regular text notifications as soon as your pet is out of his designated area. It is durable and waterproof so it will function in all sorts of climates and environmental conditions. Recommended for pets weighing 15 pounds or more and can be easily attached to a collar or harness. It does require a service plan to send cellular messages, which gives you the capability to monitor multiple pets with one single device. One of the key factors to remember when deciding on the right GPS Tracker for you is the purpose. Your expected use of the tracker should be an important determining factor in the type of tracker you purchase. Your options can vary from tracking vehicles where you may need something that’s permanently affixed to something that is more portable for tracking smaller objects or people. Today, people use GPS for many things; even the old GPS mapping device of the 1990’s (MapQuest) is now outdated. In fact, using maps to get from point A to point B are gradually becoming unnecessary because of GPS Guidance Systems that can give directions in real time is now available. There is a marked difference between GPS Navigators and GPS Trackers though, so make sure you know your exact needs before you start your search. Those who are interested in keeping track of their vehicles will probably get more benefit from those devices that are more geared towards vehicle monitoring while those who are concerned with keeping track of their children, pets, and other possessions will find better choices among the more portable devices. Also, consider just how much communication you’ll need. If it’s important for you to have two-way communication with your new GPS Tracker you’ll want to take a closer look at DeLorme inReach and the SPOT Personal Tracker, but if you just want to monitor the movements of your target then you’ll appreciate Spy Tec Yepzon Personal Tracker. Consider whether or not you’ll need voice instructions to direct you to certain locations. Some models only give you maps to pinpoint the location so if you’ll need more than that to let you know where your object of interest is, you’ll have to look at the different communications systems they each offer. Finally, you want to take a closer look at the plans that each device offers. GoldStar CMS explains that there are several things you should have in mind when choosing a GPS Tracking plan. 1) The reputation of the company you’re purchasing from. 2) Their backup systems in case of an emergency or if the were knocked off line for some reason. 3) Support. 4) The technology and 5) The return on your investment. Taking all of these things into consideration can help you to cut through all the different types of GPS Tracking systems to find the right one for your unique needs. There is a wide range of options that fall under the category of GPS Trackers, so it’s worth it to take the time to find out all you can about them before you make your decision. We know that shifting through all of the possibilities can be quite time consuming but it has been our endeavor to give you enough information so that you can make a knowledgeable decision. Our choice for the Spy-Tec-STI_GL300-Portable-Tracker was made based on its adaptability to a variety of circumstances but we also understand that it doesn’t meet every possible scenario that may come up. As you go about shopping for your next GPS Tracker keep these points in mind to help you along. We are confident that you will find the ideal GPS Tracker to meet your unique needs.